The calibration data is used in the Calibrator Addon (which uses a Genetic Algorithm to calibrate RDII, Subcatchment, Infiltration, Groundwater, Pipe, Node or Pump input data to calibration data) by running a model many times to optimize the fit (Figure A). The fit between measured and simulated results can be viewed in the Output Report Manager with comparison statistics on the graph (Figure B). The monitored data is linked to your model using the Calibration Tool (Figures C, D and E) and the GA Calibration process is controlled by many best fit options (Figure F). 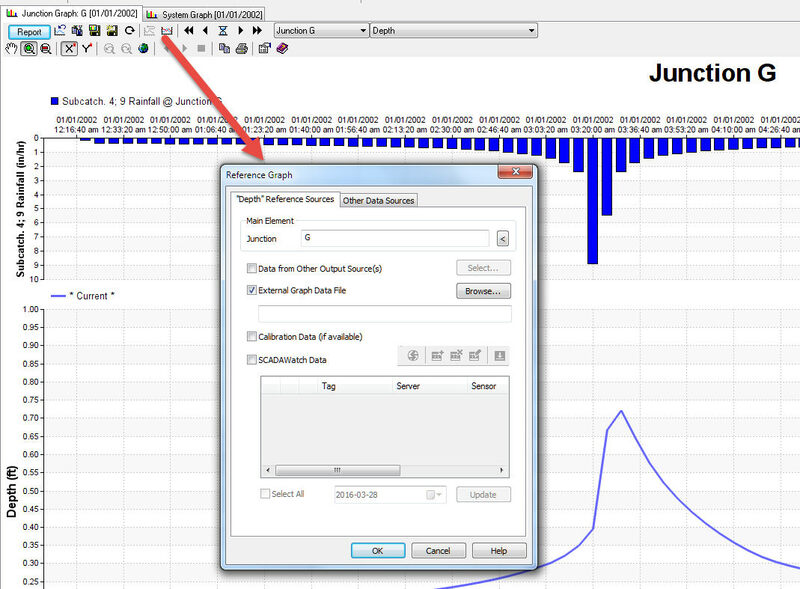 Figure B. Calibration data and Flows or Node depth are compared directly in the Output Manager of InfoSWMM. Figure C. How to Enter the Calibration Data in the Tools Menu. Figure D. Calibration data can be node depth, node head, inflow, flooding, quality, link flow, link velocity, link HGL, Runoff, Snow Depth and Groundwater in ASCII files. Figure E. The Calibration data can be selected and Editing in the Tools Dialog.